A Visual Inspection showed no problems. At Florida Home Inspection, Inc. we offer complete visual, air sampling, and thermal imaging mold inspections. In southwest Florida’s subtropical, humid atmosphere, mold is a part of the environment. Molds reproduce by means of tiny spores; the spores are invisible to the naked eye and float through outdoor and indoor air. Mold may begin growing indoors when mold spores land on surfaces that are wet. In Florida, that can be anywhere. At Florida Home Inspection, the purpose of our mold inspection is to determine the presence of mold spores in your home, apartment or condo. Our inspector will then determine what kind of mold was found, and the amounts in the air or on a surface. We also determine if the amount of mold is normal or elevated. Mold could be a hidden hazard growing inside your walls. 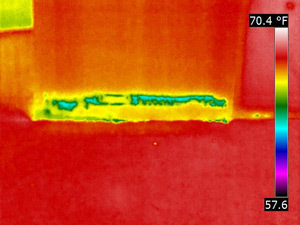 Only a thermal imaging inspection by a trained and certified inspector can find the problem areas of your structure to ensure that no mold goes undiscovered. The images to the right show the difference between a standard visual inspection and an inspection using Thermal Imaging technology. You wouldn’t judge a book by its cover, so why trust that your home is safe without seeing what’s really happening beneath the surface? Taking air samples during a mold inspection is a vital component to ensuring your family is safe. Air samples can identify the different types of mold spores in the air and the level of exposure that exists. Since mold spores are invisible to the naked eye, it is important to hire a certified inspector to conduct a thorough mold inspection of your home or condo. The inspectors at Florida Home Inspections take the health of you and your family seriously by acquiring air samples during your mold inspection. Indoor Air Quality testing is based on a sterile sampling of indoor air, and a control sample of outside air, these samples are then sent to an accredited lab for processing, reports are then returned (usually with-in 3-4 business days) indicating if there is an elevated amount of spore inside as opposed to outside. This is what would have been missed if only a visual inspection would have been done. Mold can grow and spread through a home undetected. 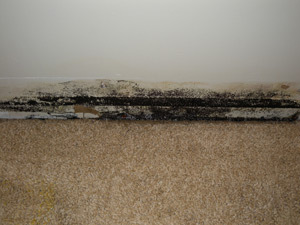 It is for this reason that we recommend a thorough mold inspection for your home or condominium. Mold can damage drywall, effect ventilation, and cause a variety of health problems, especially in those with allergies, the young or elderly. Molds produce allergens (substances that can cause allergic reactions), irritants, and in some cases, potentially toxic substances (mycotoxins). Inhaling or touching mold or mold spores may cause allergic reactions in sensitive individuals. A good mold inspection can save the home owner thousands of dollars in medical expenses from mold induced breathing and respiratory problems. 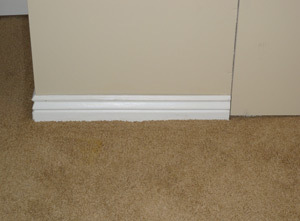 When mold is found, our inspection can to determine the cause of the mold problem and suggest solutions. Contact Florida Home Inspections, Inc. today to have your home inspected for mold. 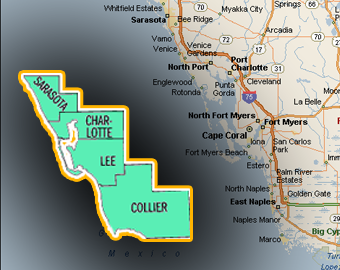 Serving Port Charlotte, Punta Gorda, Englewood, North Port, and all of Southwest Florida.